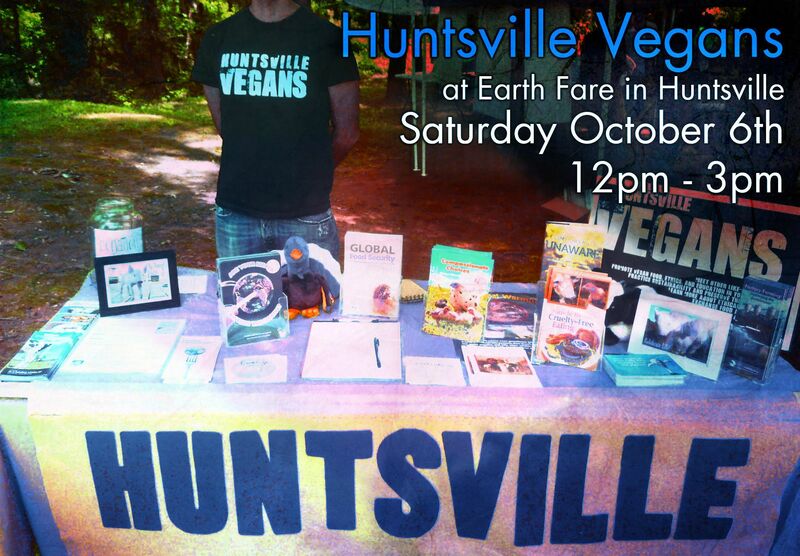 Huntsville Vegans will have a table set up at Earth Fare in Huntsville on Saturday October 6th, from noon to 3pm. We’ll be distributing information on veganism and animal rights, showing videos, taking questions, and sampling out some vegan goodies! We’re also taking sign-ups for our newsletter, collecting contact info for petitions, and looking for volunteers for future events and outreach. Come say hi and meet some vegans! Also, we need tabling help to make this happen. 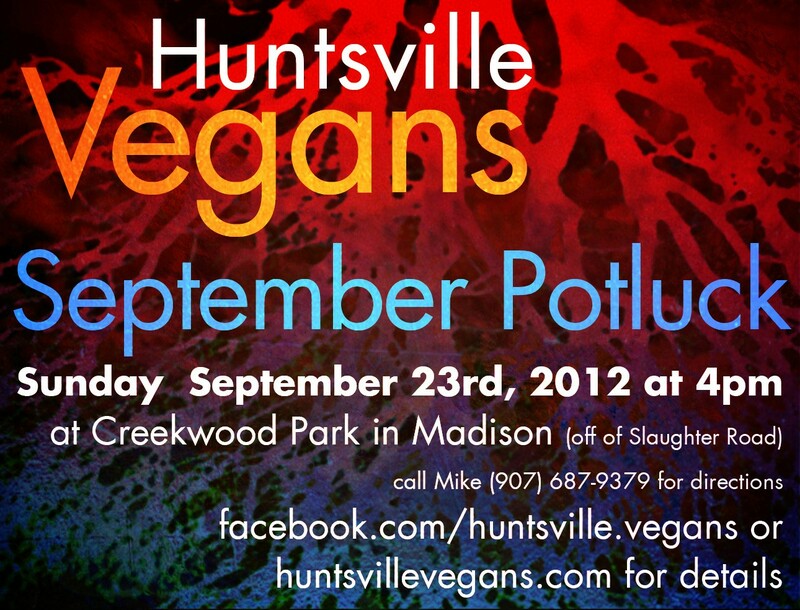 Please RSVP by emailing huntsvilleveg@gmail.com and come out to table with us. We’re currently taking t-shirts to print, so if you need a Huntsville Vegans shirt (not necessary, but kinda cool) to wear for tabling or other event, find a dark-colored shirt (or several shirts) you like that fits you, and get it (or them) to us soon. They should be bagged with your name on the bag, along with three dollars per shirt to cover the screen-printing. Please do this asap. If you have any questions or suggestions or would like to help out, please message email us at huntsvilleveg@gmail.com. We look forward to meeting all of you. On Sunday September 23rd Huntsville Vegans will have its September potluck (theme: Jewish Cuisine!) at Creekwood Park in Madison off Slaughter Road [360 Harvestwood Court, 35758]! When we scheduled this potluck we were on the lookout for a theme, and when we noticed that this one is just a week after the 2012 calendar date for the Jewish new year (Rosh Hashanah) we knew we had one. Whatever you might bring to share, don’t be constrained (or discouraged) by a prompt. Anything vegan is wonderful. Have fun! Our potlucks have been a wonderful, energizing treat. Come join us again for good food and good company, and we’ll have an even better time! Vegans AND non-vegans are invited, but we ask that all dishes be vegan. If you’re super-busy and can’t cook something in time, we still want to see you! Earth Fare sells some lovely prepared vegan foods. Otherwise, we look forward to trying your creations. What about kids? Dogs? Guitars? Bring a musical instrument and we’ll have a rhythm jam (we mean it)! Dogs are welcome, kids are welcome. Bring blankets for sitting on the grass, and water-guns for cooling off if it’s warm. If you have any questions about the potluck, or want to bring something but don’t know the first thing about vegan cooking, please email us at huntsvilleveg@gmail.com. We look forward to meeting all of you! The UAH Vegetarian Association will be hosting its first documentary night. We will be screening the film Peacable Kingdom. Some of the officers will be providing snacks, but it would be greatly appreciated if any one else would like to bring vegan snacks! “A riveting story of transformation and healing, PEACEABLE KINGDOM explores the awakening conscience of several people who grew up in traditional farming culture and who have now come to question the basic assumptions of their way of life. 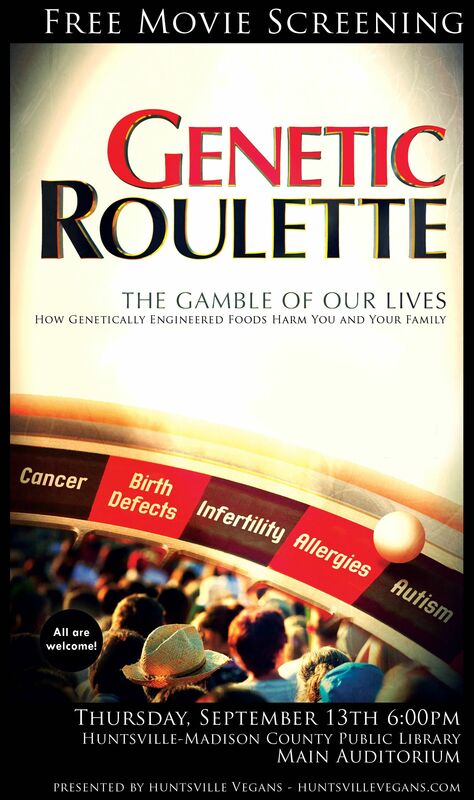 Huntsville Vegans is hosting another free monthly movie night/food sharing on Thursday, September 13th, with a screening of Genetic Roulette: The Gamble of Our Lives (2012). Our monthly movie nights take place on the second Thursday of each month at the Huntsville Public Library (in the auditorium on the ground floor) in Downtown Huntsville. Doors open at six, and we’ll start the movie around 6:30. “Are you and your family on the wrong side of a bet?